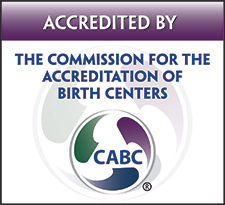 Blossom is Licensed by the state of Arizona and accredited by the Commission for the Accreditation of Birth Centers (CABC), as well as a member of the American Association of Birth Centers (AABC). Blossom Birth and Wellness Center empowers women to be in control of their life transitions. We validate the deep meaning of these events, including preconception, prenatal, birth, postpartum, FertilityCare Appreciation, Creighton Model System and NaproTechnology. Blossom accompanies you in these events by offering dignity and respect for your individual journey. Our experienced and accredited staff provide a women-centered care program focused on evidence based best practice. This approach offers you confidence to make informed choices throughout your family’s life stages. If you are interested in learning more about our facility, staff, and practice, please send us a note through our contact form to set up an initial appointment. If you would rather, you are always welcome to reach us at our phone number (602) 256-7726 during our regular office hours of Monday through Friday from 9am to 5pm Arizona time. We look forward to working with you and your family on this next exciting journey together.